How do the justices of a nation's highest court arrive at their decisions? In the context of the US Supreme Court, the answer to this question is well established: justices seek to enshrine policy preferences in their decisions, but they do so in a manner consistent with `the law' and in recognition that they are members of an institution with defined expectations and constraints. In other words, a justice's behaviour is a function of motives, means, and opportunities. Using Norway as a case study, this book shows that these forces are not peculiar to the decisional behaviour of American justices. 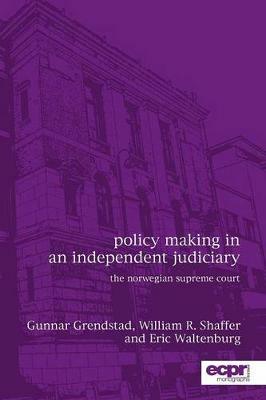 Employing a modified attitudinal model, Grendstad, Shaffer and Waltenburg establish that the preferences of Norway's justices are related to their decisions. Consequently, the authors show how an understanding of judicial behaviour developed and most fully tested in the American judicial system is transportable to the courts of other countries.